GoggleGear safety goggles go beyond the standards with a combination of design and performance features rarely found with other safety eyewear. Low profile design offers a clear high wrap lens with an anti fog hard coat lightweight frame and a comfortable fit. Soft foam flange seals entire lens perimeter to help keep out particulates, and includes top and bottom vent channels to increase airflow and help minimize fogging. Polycarbonate lens absorbs 99.9 percent ultraviolet light. Medium sized goggles come fully assembled and with an adjustable, flame retardant elastic headband for secure fit in active applications. Goggles can be used with existing 3M Lexa Protective Eyewear. 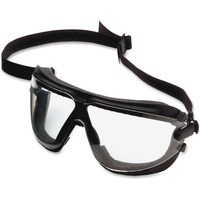 Recommended for assembly, cleaning, electrical, facility maintenance, grinding, machine operations, painting and sanding, this safety eyewear meets the requirements of CSA Z94.3 2007 and the High Impact Requirements of ANSI Z87.1 2003.